Powers/Abilities: Gahck is incredibly gifted in fighting abilities, endurance and stamina, but is otherwise a normal female human. History: (Wolverine: The Jungle Adventure) - Wolverine arrived in the Savage Land, on the trail of whoever was behind an assassination attempt on him. While flying over the area, he lost his lighter, and the Tribe of Fire claimed it as a gift from the gods. Later, Wolverine arrived in their home area and reclaimed his lighter. Startled by this being, the Tribe sought to see if he was a god or demon, and their leader, Gahck, challenged him in combat. Originally clad in an outfit that hid her female form, Gahck gave Logan a tough fight, but he managed to defeat her. 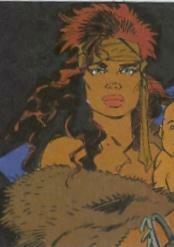 Gahck was removed as leader of the tribe, and as such, offered herself to Logan (the new leader) and revealed herself to be female. Though she didn't understand his tales of why he was there, she bedded with him. Over the next few weeks, Logan continued to live with the Tribe of Fire, and proved himself by killing a dinosaur bare-handed. The Tribe then fulfilled his rituals, with Gahck applying warpaint to his body. When Falke's son Chakel was feared dead after an attack by the Honker of Doom (a giant creature that had long terrorized the clan), Logan tracked and destroyed the monster, learning it was a cyborg. Gahck followed him to a lair that turned out to be one of Apocalypse's. There, a rogue robot of Apocalypse's captured the two of them. However, Wolverine broke free and ordered Gahck to take a rescued Chakel with her, after which Wolverine destroyed the robot. After that, Wolverine used the lighter (which, as it was a gift from Nick Fury, doubled as a bomb) to blow up the secret compound and flew out of the Savage Land. Unbeknownst to him, sometime after he left, Gahck gave birth to their child. Comments: Created by Walter Simonson, Michael Mignola and Bob Wiacek. A few years back, a small firestorm erupted on the internet and continued to brew when some sources began to refer to Wolverine having a son named Erista. Well, this is the root of it. While I'm not sure who came up with the name Erista (or why), it was officially made canon in the Official Handbook of the Marvel Universe: X-Men 2004. Presumably, Gahck was returned to her status as chieftain after Logan left, but it is unconfirmed. 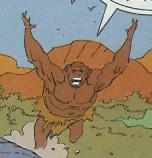 AFAIK, "Honker of Doom" would be an homage to Gold Key (and later Valiant & Acclaim's) Turok: Son of Stone, in which dinosaurs were referred to as honkers. Son of Falke, Chakel went on a hunting expedition and encountered the Honker of Doom. While the rest fled, Chakel stood his ground and was swallowed whole by the cyborg creature. He was taken back to the compound of the robotic Apocalypse double, who began his process to turn Chakel into a cyborg. He was rescued by Wolverine and Gahck, though he retained a small amount of cyborg parts. 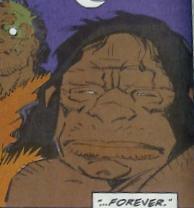 Gahck's and Logan's son, born sometime after Logan left the Savage Land. Tribe of Fire member who let his anger at Chakel's apparent death overtake him. Believing Logan failed them, he speared Wolverine through the abdomen. After Logan pulled the spear out, Falke accepted to forfeit his life, but Logan simply told him to never do that again. Tribe of Fire member who reported to Logan that the hunting group lost a member. Tribe of Fire member who was on hunting team with Chakel, told Logan of how the Honker of Doom apparently killed him. Eldest of the Tribe of Fire members. He told Logan where to find the Honker of Doom and the area where the Apocalypse robot's lair was. 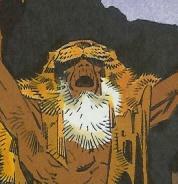 After Logan departed, he regaled the Tribe with tales of Logan. A tribe in the Savage Lane, the males of the clan appeared to be nearly Neanderthal in appearance, while the women were more developed in their evolution. Wolverine became their leader when he defeated Gahck.